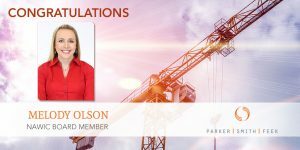 Please join us in congratulating Parker, Smith & Feek’s Melody Olson, VP, the newest elected Puget Sound Chapter of the National Association of Women in Construction (NAWIC) 2017-2018 Board of Director. The purpose of NAWIC is to enhance the success of women in the construction industry. The organization was formed in Fort Worth, Texas by 16 women working in the construction industry in 1953. Understanding that women represented only a small fraction of the construction industry, NAWIC was organized to create a support network. The organization has been so successful it has become the National Association of Women in Construction and added chapters nationwide. Today, the NAWIC provides its members with opportunities for professional development, education, networking, leadership training, and public service.